Home / My application is on an aging technology platform, so it’s difficult to find support staff. I need help to bring it up to date. Facing the need to modernize an aging application platform because of escalating support and operational costs, a state agency took an aggressive posture and took the steps to modernize its technology to better serve the public. To learn more, read the case study here. A government agency tasked Mainstream Technologies’ Custom Software Development team to reimagine and recreate their solution to address the challenges their legacy technology posed. 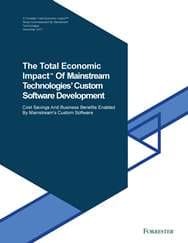 Mainstream Technologies commissioned Forrester Consulting to generate a Total Economic Impact™ study to document the cost savings and business benefits the agency generated by this transformational initiative. Click here to register to download the free CASE STUDY that details how this extraordinary ROI was created.